Proud mother, and new writer. Tips, advice, and anecdotes from a woman's perspective. Lots of people think bingo clubs are full of pensioners only, but that is not the case at my local club: Gala in Wednesbury. Sometimes I go in and see people that look too young to play, or maybe that's just me getting older. I suspect a lot of young people play online because it's easier than going out, but I find that I enjoy it better playing in the club; you get to meet people there and make new friends. You don't have to dress up, but if you want to it's a great start to an evening out because many people meet there, have a few games, and then head off the nearest pub/club. On the flip side, bingo is a great way to finish your evening, and if you win it can turn into a free night out, or if it's a 'big' win, much more than a free night out. 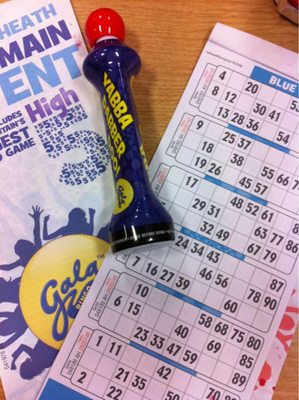 Bingo at Gala is generally about £5 to play, and you can win £100 - 300 for a full house, and up to £20,000, on one special ticket that is included in the price. The main session (at Gala) starts at 7.30pm and finishes just after 9pm, so it's not that late and there is a break about 8.30pm. They serve delicious, simple food on the premises reasonably priced including desserts. There is a bar, but I love the hot chocolate, it's like going to a social club; membership is free and you can go home much richer than when you arrived. You get a lot of chances to win, and it's exciting when you only need a couple of numbers to win. It's a great feeling when you shout and get a full house. Some people win more than once in one session; it's a lovely night out, but not a late night - what more could you ask for? My grandparents used to play bingo on a weekly basis years ago. My grandma introduced me to it I used to it at the seaside when I was little. Played for a £1 a game and won enough tokens to buy a small toy.